English sparkling wine ripe for Japan success? Japanese wine importer Mottox has taken on four English sparkling wine producers for the first time, believing the category, which its chief buyer describes as “the brother of Champagne”, to have the potential to blossom. 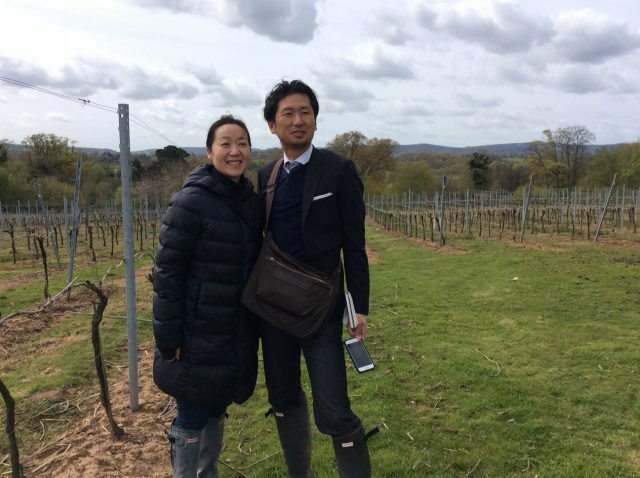 Kayo Kono, (left) chief buyer and brand manager at Japanese wine importer Mottox, on tour in England last week. Pictured here at Stopham Vineyard in West Sussex, one of Digby Fine English’s partners. “After having sampled English sparkling wines for seven years, I became convinced about the quality last year,” said Kayo Kono, chief buyer and brand manager for Mottox Inc. “Also, I have quite successfully handled the brand-building activity of our main Champagne and felt that the sales team was ready for a new adventure. Another important decision from my side relates to global warming. I knew that Champagne producers recognise English terroir for producing good sparkling wines. So over the long-term, there is no reason to ignore English sparkling wines”. For now, Mottox has taken on wines from the portfolios of Hush Heath in Kent, Hattingley Valley in Hampshire, Digby Fine English and Bolney Estate in West Sussex, secured with the help of the British Bottle Company, exporters specialising in English beverages. Sales of Champagne have been steadily growing in volume and value since 2009, signalling Japan as a serious consumer of upmarket sparkling wine, making it fertile ground for the development of English sparkling wine. Kono believes it will take at least five years for the category to establish itself in Japan, but is confident in its future success. Asked why she believed English sparkling wine was ripe for success in Japan, Kano described it as “the brother of Champagne with its own charm”, but said Champagne was still “the king”. Targeting specialised bottle shops and restaurant with international wine lists, Kono is confident that English sparkling wine can expand its presence in Japan.